Spells, sentiment and Face the Raven (2015) | Randomwhoness: a Doctor Who blog by Johnny Spandrell. Sampling stories in random order. Doctor Who takes a rare turn towards the magical in this pivotal episode in Peter Capaldi’s second series. The hidden pocket world of Trap Street, a cornucopia of refugee aliens, has the enclosed streetscape feel of Harry Potter’s Diagon Alley. So it’s fitting that the story’s monster, the ethereal Quantum Shade, is indistinguishable from magic. It’s a tattoo which turns into smoke which turns into a raven which flies right through your heart. Even the Doctor, usually a stickler for pseudoscience, simply calls it “a spirit”. There’s witchcraft about. This sorcery manifests itself in a curse placed upon an old friend, graffiti artist Rigsy (Joivan Wade). While he’s slept, he’s been mysteriously tattooed with a number which is ominously ticking down (referencing urban myths of humans being interfered with by aliens while they slept, and the old biblical superstition of people being tattooed with numbers at the end of days). Rigsy’s an interesting choice for a return appearance. That tattoo could have been placed on the neck of a more familiar semi-regular, like Kate Stewart or Osgood or even Jenny Flint, had this been set back in Victorian times. But Rigsy allows the element of parenthood (a Moffat favourite) to come into play, and raises the stakes by giving us a baby-shaped reason for saving his life. Plus it never hurts to see another sympathetic young black man on Doctor Who. Even though the show’s record on diverse casting is not too bad, Rigsy still feels like a more novel choice and one which speaks to the yoof, innit. The Doctor knows that whoever cast the spell which resulted in Rigsy’s neck ink will be found in a trap street; a hidden pocket world named after an intentionally bogus street placed on an otherwise accurate map. (I’m reminded of when the seventh Doctor once claimed to be “contemplating some local cartographical anomalies”.) Quite how the Doctor knows this is where the mystery tattoo artist resides is unclear. More magic I suppose. As is the way you detect a trap street – it’s the point where you suddenly lose concentration while walking down the road. If only I’d known. I’m always doing that. I’ve probably walked past dozens of them. If she had captured the Doctor right from the get go, however, we wouldn’t get to see Clara’s ongoing development into a proto-Doctor. She’s been pulling a few Doctory tricks for a while now, but she’s developed an over confidence which leads to hubris. When she voluntarily takes on Rigsy’s ticking clock of a tattoo, it’s she who has made the poor life choice, which leads to her (*cough* faux) death. I’m not sure how I feel about setting her up to be a Doctor duplicate and then having her fail so spectacularly. On the one hand it’s classically tragic. On the other, it feels just a little sexist, to have a woman seek to emulate the performance of a man, and then fail. Potential sexism aside, it’s a little like Earthshock, a seminal old Who serial for Moffat, in that the companion takes over the Doctor’s role and fails at it, leading to their death. But the way these deaths pan out is quite different. Clara’s death is forecast a handy 8 minutes early, so there’s time for brave speeches, outraged exchanges and teary goodbyes. In Earthshock, Adric’s death was delayed until the very last moments, giving the audience that slow dawning realisation throughout the episode that this time, things weren’t going to work out. Adric’s is still the companion’s exit which packs the greatest punch, because it’s inherently unsentimental. Clara’s pre-planned demise gives us time to dwell on it, and as such we begin to doubt whether this really is a final goodbye. Earthshock is a clear influence on Face the Raven, but the latter is doing something quite different. When Adric died, all the fifth Doctor could do was mourn briefly then move on. The twelfth Doctor wants to not only avenge Clara’s death but also reverse it. 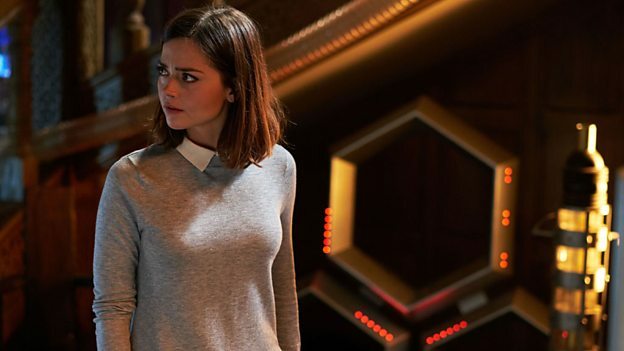 It’s in Clara’s attitude to this white knight syndrome, both here and in Hell Bent that we find an antidote to the patronising “you can’t be a Doctor” approach. She accepts her choices and their consequences. She doesn’t ask the Doctor to save her. She takes responsibility. And there’s something great about a hero who does that, as we watch from a world where so often people rush to blame others, the government, their family or whoever for their problems. Clara dies a soundless death and the Doctor disappears in a flash of light, defeated but defiant. He’ll be trapped in a clockwork castle for billions of years, then he’ll fight his way out and rescue Clara between heartbeats. She’ll end up travelling the universe, without a pulse but still walking and talking. She’s the impossible girl again. It’s yet another kind of magic. LINK TO The Hungry Earth/Cold Blood. Faux deaths of companions. NEXT TIME… It’s the end of Ten in The End of Time.